If you want to take your workouts to a higher level and blowtorch body fat, my Dumbbell and Medicine Ball Metabolic Workouts are what you need. 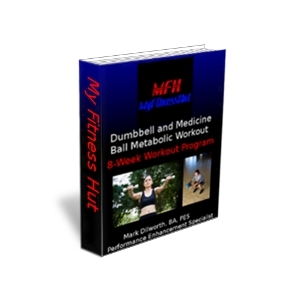 "Thanks I will give this one (DB and MB Metabolic Workout) a try, I did your 14 day challenge (14-Day Accelerated Fat Loss Program) and lost 12 pounds! Thanks again and have a great day." ---Stephanie H.
I used many of the ideas you wrote about and lost 50 pounds between April, 2008-March, 2009, so everything that you wrote is very true and very very helpful. It's almost a year later and I've kept off 45 of them, and the other 5 will fall away soon (too much eating out these past couple of months!). So I think a lot of women will relate to what you are writing. Have a great day!" Take care, Alison S.
"I have lost over 60 pounds in the last 5 months using My Fitness Hut's workout programs, nutritional advice and just staying with it and not quitting....and my body fat percentage has decreased from 45% to under 30%!" ---Jorge P.
a) Doing these types of short burst workouts will change your hormones allowing your body to naturally regulate fat burning, appetite and moods. Short burst workouts, such as interval cardio and circuit weight training had these advantages over the low-to-moderate intensity workouts: a) more release of fat from cells, b) more fat used as fuel during exercise and c) increased metabolic rate after exercise. All it takes is 20-30 minutes of workout time. b) Doing this type of exercise will burn more calories and fat during and after your workout. Exercise Post-Oxygen Consumption (EPOC) causes your body to burn more calories and fat after a tough workout. Your body has to work harder to get back to its pre-exercise state. Fat burning and metabolism can increase for up to 48 hours after your metabolic workout. c) Long, traditional 1-2 hour workouts can have a negative impact on hunger and stress hormones which can cause increased appetite and cravings for sugary and other fatty foods. Forget about weight loss and concentrate on fat loss. Building muscle mass will burn the fat and permanently speed up your metabolism. Don't let fear stop you from reaching your fat loss and fitness goals! Start Burning More Fat and Building Your Lean Body in Less Time! You will get 8 week workout programs, fat loss advice and nutritional advice.